What are Type-D Antistatic Bulk Bags? Type-D Antistatic Bulk Bags are made from special antistatic fabric material that is made from static dissipative threads that require no special electrical grounding system. These are made to store and transport dry flammable materials which are at risk of igniting during storage and shipping. What are the advantaged of Type-D Antistatic Bulk Bags? The Type-D Antistatic Bulk Bags are designed with special antistatic thread that is helpful in removing unwanted static electric charges from the bag’s material. At times, especially while storing and transporting flammable goods, there is always a risk of unwanted static charge igniting the goods. Type-D Antistatic Bulk Bags are easier to make and are also cost-efficient to purchase as compared to other types of bulk bag designs. What are Type-D Antistatic Bulk Bags useful for? Type-D Antistatic Bulk Bags are most useful for storing and shipping highly flammable dry and solid substance. These bags are made from special antistatic fabric to avoid unwanted electrical static charge from destroying the flammable goods stored within. Care needs to be taken to avoid using in applications where water, grease or other such conductors may contaminate the bag’s surface. Why choose Simplex Chemopack Type-D Antistatic Bulk Bags? 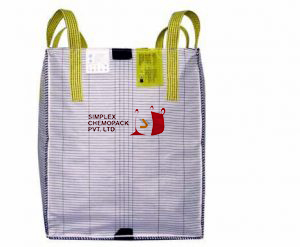 Simplex Chemopack Private Limited is considered to be a leading provider of efficient and effective packing and shipping solutions. The Type-D Antistatic Bulk Bags from Simplex are designed using the latest technology and developed with the best-quality material to ensure better usability and longer life.